I suffer from a constant case of wanderlust, the inability to pass by a macaron shop without a taste, and love of impromptu adventures, big and small. What better way to kick off a dreamy blog with how the French will be spending their summers– bounced into the refreshingly cool (not so much) waters of the Seine. In 2009, the Parisians turned the banks of the Seine into a Miami-style beach club and last year it was all about floating gardens and pop-up restaurants. 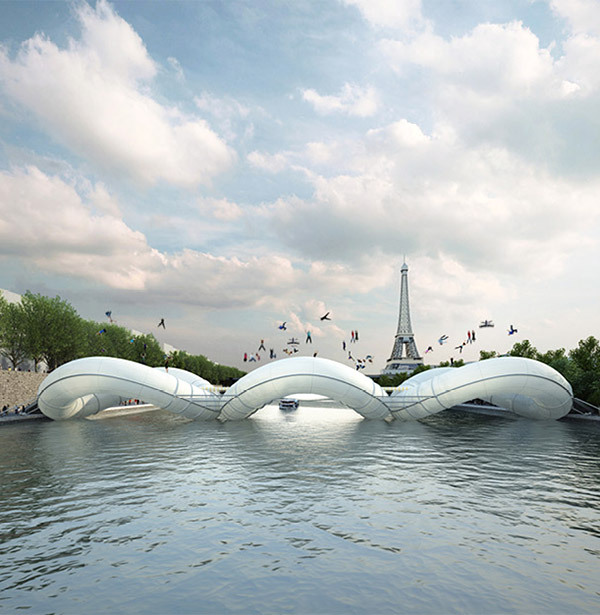 Clearly, I’m due a voyage this summer, as I think the Parisians will be hard pressed to conjure up a better idea than the quintessentially French trampoline bridge. Just keep those Chanel bags in Ziplock! Find the bridge details here!